Today I mark three anniversaries: it was thirty-three years ago today that I graduated from Windham High School in Willimantic, Connecticut and began my ascent into adulthood (snicker), it is my six-year anniversary as an Emergency Medical Dispatcher with American Ambulance (yay! ), and also the one-month anniversary of my time in Santa Cruz with Katherine, an amazing woman who lives in an amazing place. Guess which one I have a few pictures of? No, no - that's not Santa Cruz in that picture above, that would be Aptos (I think) which is south of Santa Cruz (Katherine please correct me if I'm wrong!). 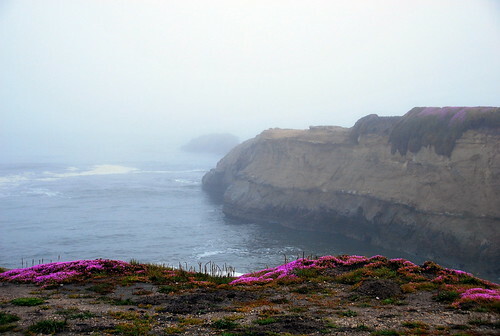 On my first day in Santa Cruz, Sunday the 3rd, we took a drive along the coast and this was one of the places we saw. It was pretty foggy as it had been raining in California for an unprecedented number of days in honor of my arrival but it added a rather interesting, almost Hitchcock-esque feel to the area. This is part of the infamous Steamer Lane in Santa Cruz where surfers wait patiently to catch a wave and sea lions bark loudly in the fog like flippered foghorns warning of the rocks ahead. 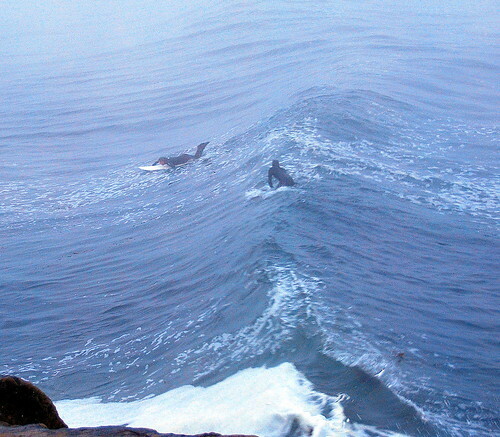 In spite of the chill and the fog and the encroaching darkness, men dressed as seals in black rubber wetsuits wait for the ocean swells that will take them on a ride across the cold waters. 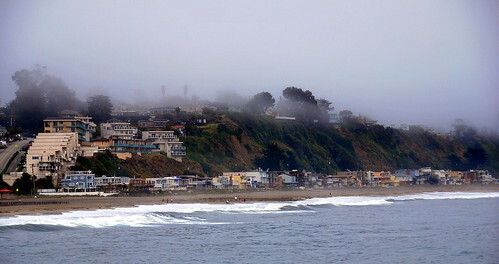 Even in the fog, though, Santa Cruz has much to offer - especially when you've got an ace tour guide to lead the way! Come on back tomorrow and I'll take you on Day Two of my trip to the California Coast - one month to the day! Don't you love anniversaries?? Congratulations on all your anniversaries! The pictures from California are great. I especially like the lighthouse shot. That is definitely a candidate for framing. I really like the Steamer Lane shot. That fog makes it much more interesting than a regular sunny day. Love the purple flowers, too! Very cool. I was in CA once, fortunately we didn't have any rain, but unfortunately my Ex didn't share my love of photography and rarely stopped at points like this that we saw. Markie on the other hand, he pulls over sometimes before I even can ask. LOVE the lighthouse with the flag waving. Magnificent! I'd love a print of that one for my mother. She loves/collects lighthouses. smile. 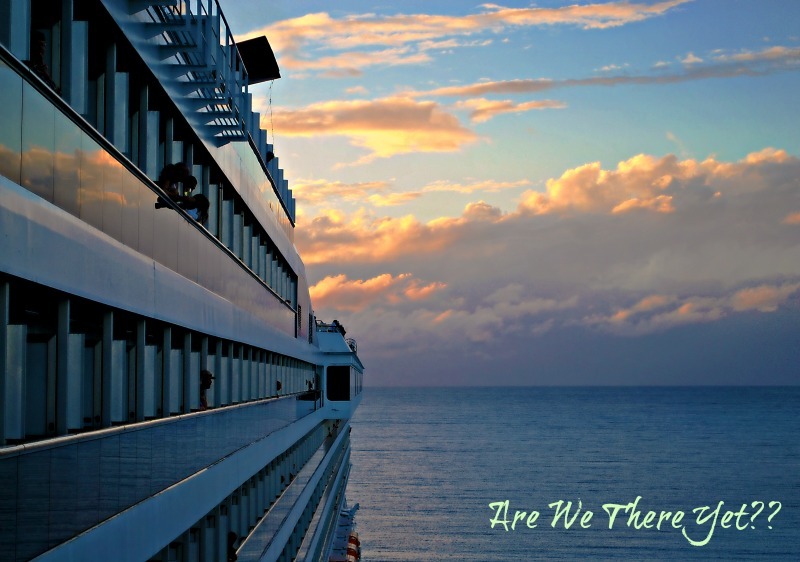 it was a fun time...even if we couldn't find a sunset for you. It is interesting to see your hometown through someone else's eyes. Your previous post about the lighthouse included details I had never known! Has it really been a whole month? I too would like to see a picture or two of the other anniversaries! I know a year ago today I was running around trying to get everything done for my move up to NY. Santa Cruz and Katherine are amazing. What a great read. Linda you make me home sick for California.. one of the most beautiful states in the world. :) Happy 3 to you girlfriend. Sigh....I've run out of adjectives to express my pleasure in your photography. I love the coastline when it's shrouded in fog - eerie. I loved your alliteration with the finned foghorns! 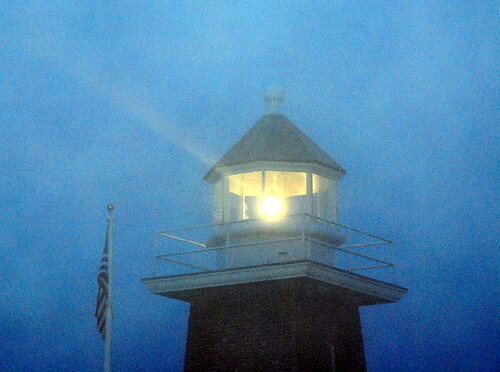 I love the lighthouse shrouded in fog, with a flag alongside. Very neat shot.